CAMPBELL, California, January 30, 2014 (ENS) – The world’s largest EV charging network, ChargePoint, knows a thing or two about “charge rage” from dealing with its 15,300 U.S. charging locations, half of them located at workplaces. By the end of 2013, EV and plug-in vehicles on American roads had reached nearly 170,000, with about 10,000 sales in December alone. Many of these EV drivers need to charge up at work, and workplaces have become sites of charge rage as drivers compete for access to the charging stations. Frustrated EV drivers have unplugged other people’s cars without their permission, even while they were still charging, creating animosity between employees. Even EV-driving employees at companies in America’s high-tech Silicon Valley core are finding it hard to charge their cars at work. For drivers, courtesy requires that they don’t hog an EV parking space and only park in designated charging spots if they need to charge. Chargepoint has compiled a list of how companies are dealing with a rising demand for charging at work, how they are avoiding charge rage by keeping drivers happy and plugged in. 1. Workplaces have recognized they need one charging spot for every two EVs. This allows people to plug in when they get to work and then move their charged car at lunch so others can plug in during the afternoon. Chargepoint is urging businesses to anticipate the future popularity of electric vehicles and the resulting need for charging stations and install enough of them now to meet future demand. 2. Location is crucial. 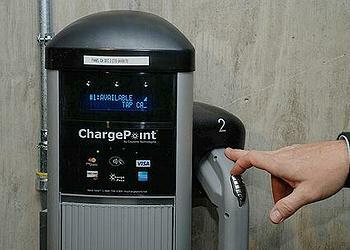 Install the stations in a place that allows multiple parking spots to access the charging port. Ensure there is adequate signage that makes it clear the parking spots are for plug-in vehicles. 3. A “Valet Bowl” helps keep those in demand charging stations from standing idle for long. Some companies have a bowl at the front desk where employees leave their keys so that their car, once charged, can be moved to make room for another employee. 4. Companies have found that creating a community dashboard or email list connecting EV drivers within a company is a good way to ensure cooperation and efficiency in getting everyone plugged in and charged. 5. Some companies treat EV parking spots like a conference room and enable employees to reserve them in advance. ChargePoint allows companies to set up a reservations feature that drivers can access via mobile app and website. ChargePoint makes advanced hardware and cloud based software. ChargePoint’s open network is utilized by many leading EV hardware makers and the company encourages all EV charging manufacturers to join. Every 10 seconds, a U.S. driver connects to a ChargePoint station and by initiating over 3.7 million charging sessions, ChargePoint drivers have saved over three million gallons of gasoline and driven 65 million gas-free miles. ChargePoint’s real-time information network on the availability of charging locations throughout the nation comes with the ChargePoint mobile app, online and via the navigation systems in several EVs, including the new BMW i3 and the Nissan Leaf.